When I first played a Metro game, I did not enjoy it. I really enjoyed the setting, story, and atmosphere, but the game was completely broken by its choice to make ammunition also serve as the game's currency. I quickly grew tired of having only a handful of ammo available for a mission and with every shot I was making it less likely that I would be able to afford an upgrade when I returned to base. After that experience I had no desire to return to the series until I played a demo of Metro Exodus at E3 2018. The game was no longer a constrained, linear affair and the ammo supply, while still limited, felt like it was manageable as long as you weren't careless. I was intrigued and left the demo wishing that I could have played more of the game, so I jumped at the chance to review the game when it was released. If you've never played a Metro game, or missed some of the series like me, you don't have to worry about jumping into the series at this point. The game's opening sequence does a good job of introducing you to the world of Metro and the opening mission will familiarize you with the major characters. Of course the experience will have more meaning to those who've been with these characters since the beginning, but you can still enjoy the game and its story if it's all new to you. The Metro series is set in a post-nuclear war Moscow where the survivors have escaped the radiation on the surface by retreating below ground into the tunnels of the Moscow Metro system. You play as Artyom, a member of the military force known as the Spartans who protect a major settlement. Artyom believes that there are survivors somewhere on the surface, and he frequently goes above ground in an attempt to make radio contact with someone much to the chagrin of his commanding officer and father-in-law. Without going into the details and spoiling the story too much, it turns out that Artyom is right, and with the aid of a stolen train that they dub the Aurora, the Spartans leave the Metro and head across the vast Russian wilderness. The Aurora is not just a vehicle for the Spartans, it also serves to drive the game along. The train will transport you from one open area to the next, giving you a variety of open world zones to explore. Each zone is notable different in terms of post-nuke biomes, enemies, and missions, giving you far more variety of gameplay than you can get from slinking down subway tunnels and the city ruins outside their entrances on the surface. 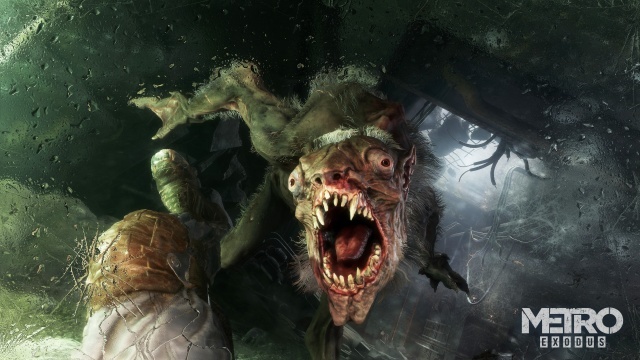 Those of you who loved the feeling of claustrophobia mixed with fear that subway tunnels provide will be happy to know that there are still such experiences to be had in Metro Exodus, but that's not the only experience that you get in Metro Exodus. The game is packed with things to discover, both large and small, and part of the enjoyment of the game comes from exploring its zones to see what's out there in the wilds of post-apocalyptic Russia. Of course, you won't be alone out in the wilderness. There are both a variety of mutated creatures and factions of human survivors to deal with. Each creature type has its own unique attacks and behaviors, so you'll need to develop a variety of tactics to survive. Some hunt in packs while others lie in wait to ambush anything that passes by. They may come swooping out of the sky, bounding out of a tunnel, or leaping up from under the surface of a body of water. You're constantly in danger and must remain vigilant so that a mutated creature doesn't take you by surprise. The game's day-night cycle also affects the kind of creatures that you'll encounter as some are strictly nocturnal, and are naturally harder to fight given that you'll have to do so in the dark. There are also a variety of humans to contend with including survivalists, bandits, paramilitary groups, and cultists, and as with the creatures you'll need to approach each group in a different way, and the game gives you some freedom in how you do that. For example, early on in the game you'll encounter an anti-technology cult and will need to escape the church that they use as their base. While you can certainly fight your way out, I chose to take a stealthy approach, and also chose to knock out the enemies I snuck up on instead of killing them. After incapacitating a number of the cultists, the others began to discover the bodies and became convinced that there was a demon in their midst. After that point, they became too frightened to engage me and I was able simply to walk out of the church. Choices like that will have an effect on your experience in the game, so there is more than the tactical situation to consider when deciding whether or not to be merciful or a stone-cold killer. The ammo as currency system in the game has been replaced with a workbench system. You collect various forms of scraps and such in the environment and from fallen enemies which can then be used to craft everything from ammo to medkits, as well as to create weapons mods and attachments. Your backpack can be used in the field to create some of the more basic items, but you'll need to use an actual workbench to get access to the full range of craftable items including better ammunition. This doesn't mean that you'll be swimming in ammo, you'll be limited by your resources and will have to decide whether a medkit, gas mask filter, or ammunition is more important to you at the moment. The scarcity of ammo will often force you into a stealth approach to combat or have you circling around a herd of mutants to avoid a confrontation. The open level design does help in that more often than not you'll be able to withdraw from a battle or make a tactical retreat before it starts so that you can return to a workbench and reload. You'll also have to spend some time and resources caring for your weapons since they can become dirty and eventually fail over time. The level of maintenance and crafting that you'll need to do is manageable, but it may be a bit much for those who want to focus on exploration and combat. The game feels more immersive than many shooters because of the clever way it integrates its UI into the game itself. When you check the map, you'll do so by pulling out your notebook and the objectives and map markers will appear as if you've written them onto the map yourself. Waypoint navigation is handled by a wristwatch that you'll always see on your arm. A damaged gas mask is indicated by cracks in the face mask, weapons appear dirty when they need to be cleaned, and so on. There is a menu system tucked under the pause button, but it's for managing less often used features and not something you'll need to stop and pop up every few minutes. For all of the immersion gained from the UI, it's odd that your character is not voiced in the game. You're constantly meeting new people in the countryside and every conversation that you have with them will be entirely one-sided. Radio transmissions from the train are one-way communications, which is strange because the person on the other end never has any way to know that you're listening. Oddest of all are the conversations with your wife, who serves as a scout for the Spartans. You'll have intimate, heart-to-heart conversations with her while just staring and not saying a word in return. 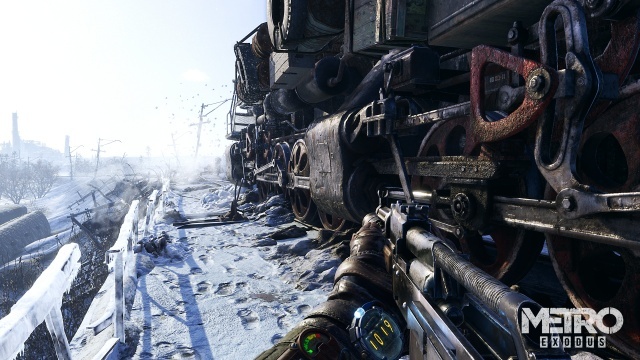 Overall, Metro Exodus is an enjoyable shooter. Taking Metro out of the Metro is a good move for the series, but the game still provides plenty of claustrophobic locations for those who enjoyed the dark tunnel crawls of Metro games past. The ammunition system is still limited, but it feels better managed and more forgiving this time out, although I can still see it as being frustrating to some players. 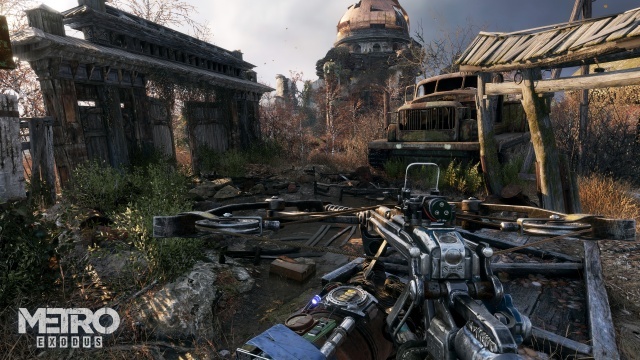 If you haven't played a Metro game before or were put off by the games in the past, give Metro Exodus a chance. You can catch this train running and enjoy the ride. Final Rating: 86% - A little daylight does Metro a lot of good.